The "Unbeatable Eagle" is one of the grill's 11 hand-pressed burgers. The months-long remodeling progress didn't go unnoticed by the thousands of drivers and pedestrians traveling daily through the busy intersection of Monroe Street and Northwest Boulevard in North Spokane. First, the "for lease" sign outside the long-vacant building — formerly a franchise location for the national chain Shari's Cafe & Pies — disappeared. A steady presence of vehicles began parking in a weedy lot out back; then, one day, new sod and landscaping arrived. Finally, new signage at the roofline revealed the hexagonal-shaped structure's new resident: Monroe Street Grill. The anticipated neighborhood restaurant opened its doors on Oct. 11, and has since seen a steady stream of customers filling its tables and booths, says co-owner LaShay Germain, who runs the eatery with husband Lonnie. The Germains, who previously owned Top of the Line Seafood and Burgers in Cheney (it closed on Sept. 1), had long eyed the highly visible corner storefront. "We had to go through Spokane to get to Cheney, and Lonnie would go through town down Monroe," LaShay explains. "We thought it would be so cool to have something like that [space] someday, but we weren't ready for something that big yet." The couple's dream finally came true when the building, which they'd previously understood was in negotiations to become a fast-food chain, came back on the market again early this year. After signing a lease in February, they started working to refresh the building's outdated dining room and scrub down its grimy kitchen, while simultaneously running their former Cheney restaurant. Most of the menu from Top of the Line was carried over to Monroe Street Grill, LaShay says, but the larger space allowed them to add several more items, including smoked meats prepared on site, grilled chicken sandwiches, a French dip and a Philly cheesesteak. 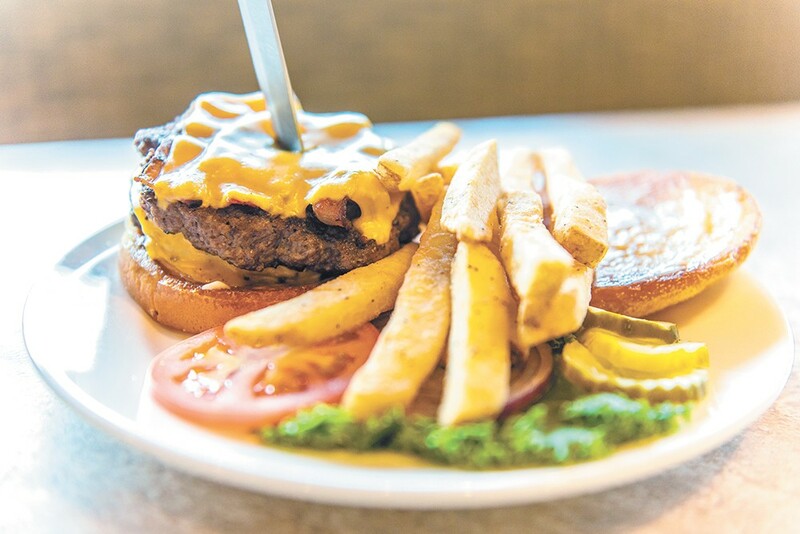 The restaurant's signature offerings include classic seafood, from Lonnie's special fish 'n' chips ($14.95) to housemade clam chowder ($4.25/$6.25) and the hand-breaded Alaskan cod fish-wich ($12.25). The restaurant's kitchen, under Lonnie's direction, also hand-presses patties for its burger list, ranging from a classic cheeseburger ($11.25) to 10 other versions that come topped with, among other combos, deep-fried dill pickle chips ($12.75), jalapeño cream cheese and bacon ($13.75), or Hatch green chiles from New Mexico ($13.25). Another menu addition already proving to be incredibly popular with diners is Monroe Street Grill's pit-smoked prime rib dinner, served on Fridays starting at 4 pm ($23.99/8 oz., $26.99/12 oz.). House pitmaster Lonnie first wraps the beef in a special spice-blend paste to marinate for 24 hours before slowly smoking it over mesquite chips. Monroe Street Grill also serves classic diner-style breakfast items starting at 7 am daily, until 11 am on weekdays and noon on weekends. In the coming months, the couple plan to unveil a cocktail lounge in the restaurant's south-facing side. Currently, Monroe Street Grill serves bottled beer and wine. LaShay expects the lounge area to open sometime in early 2018, and mentions that this spring they'll also add some outdoor lounge seating.